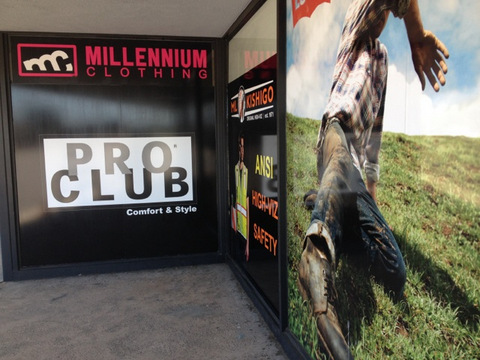 Located at 8550 Beach Boulevard in Buena Park, Millennium Clothing is a venue that is large and well-stocked. Specializing in high-quality work clothing that will last you for a while, this retailer also offers some dressy options. Expect to find brands such as Dickies, Levis and others. 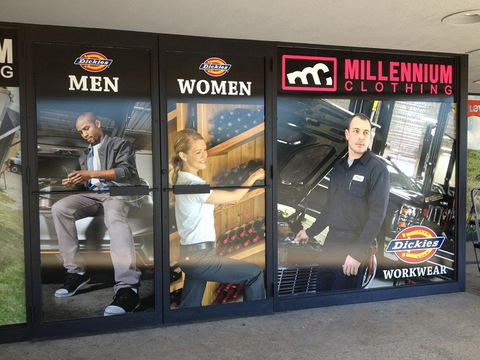 Where other retailers would have had a hard time with the 13 large window panes, Millennium Clothing saw opportunities for marketing and branding. 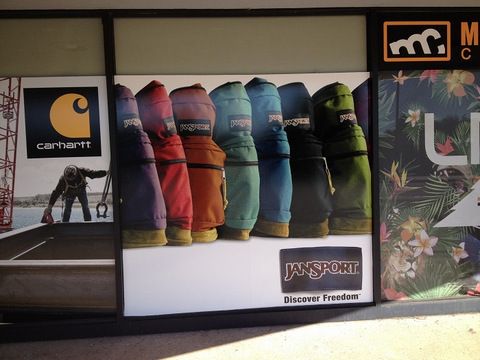 When it came time to add some hard-hitting retail window wraps Orange County consumers would respond to favorably, the company contacted Superior Signs and Graphics. We discussed the company’s vision with the management team. We began by removing old window wraps that had reached the ends of their useful lives and were also marred by graffiti. Next, we worked with the high-resolution artwork we obtained from the manufacturers that the store represents. 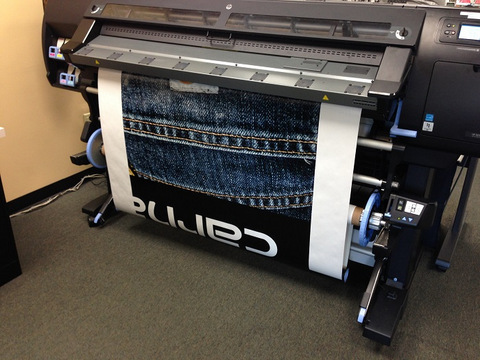 Our large format printer at work! This allowed us to print perfectly color-matched 80-inch by 75-inch window wraps that we treated with a luster laminate. Using this process not only added to the longevity of the product but also reduced the glare of the prints. It is interesting to note that the manufacturers contributed to the cost of the project in return for having their brand well-represented with highly-visible full-pane marketing prints. Consumers easily see the brands they sell! The raw materials used were 3M vinyl sheets with a laminate. When you look at the photos, you will notice that some of the window panes are not wrapped at the upper 18 inches. This is due to the fact that we will place a Millennium logo there after wrap installation. It is true that the retailer could have used translucent vinyl or perforated sheeting to allow folks a way to look outside from inside the store. Yet since they are treating the window wall as another display wall against which to place shelves, they decided to go for solid vinyl instead. By the way, we also wrapped the entrance door. 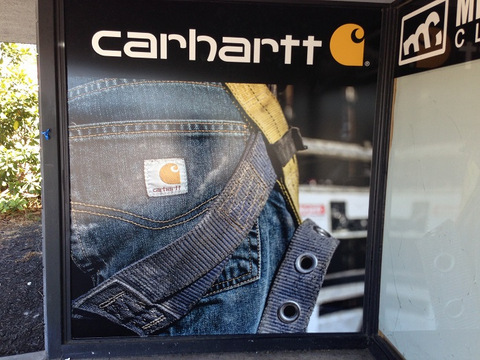 This retailer is truly committed to marketing and branding with gusto! Outstanding marketing at unbelievable prices! 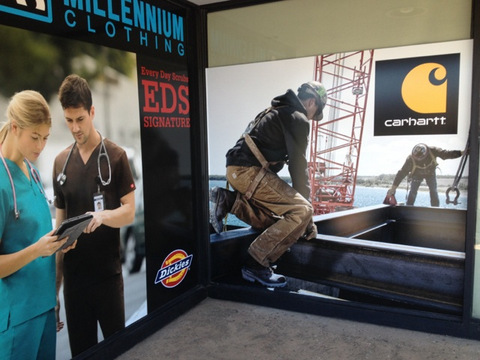 Whether you need vinyl window cling for retail stores in Orange County or would prefer to add translucent, perforated or solid vinyl, our experienced retail window wrap makers can help. Want your retail store to get noticed? Site survey. We come out for a site survey and measure the length and width of each window pane. This ensures that the wraps are customized for your particular panes. Artwork consultation. Do you have artwork readily available? Would you like us to get the artwork straight from some of the product manufacturers that you represent? Do you need customized artwork created from scratch? No problem! Manufacture. 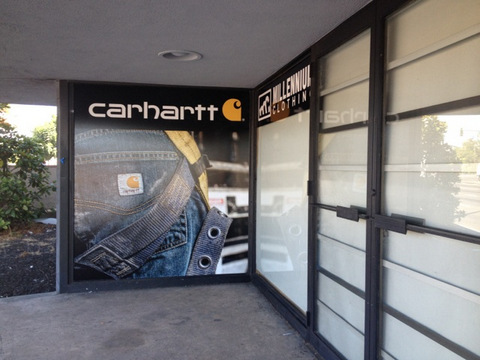 We print your window wraps on the vinyl substrate of your choice. Large-format printers allow us to avoid seams (in most cases) and create amazingly colorful rendition of your marketing messages. If you would like the vinyl to be treated with specialty finishes, we would do so at this time as well. Site prep. After we have printed the window wraps according to your specifications, we prepare the window panes. We ensure not only that they are in good shape but we also remove any old wrap or decal products that are currently installed. Are you ready to get started on your order and stand out like Millennium Clothing? Talk to our friendly representatives today!